There are many people who are always looking to go over their finances. When looking to go over your finances you will benefit by having a monthly cash flow plan. This is a template on Excel that can allow you to record all of your income and expenses. 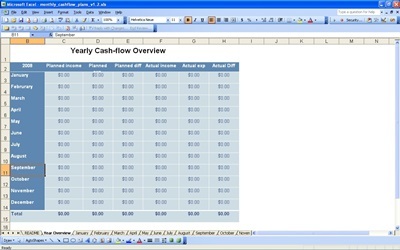 Whether this if for a business or for your personal finances, an Excel template with a cash flow plan will give you the means to evaluate your financial standing and help you plan better for your money allocation. On Excel you can use the template for two main purposes such as for a company along with your daily expenses. By using this template you will be sure to have a very beneficial tool available to help you keep your finances in order. The first monthly cash flow statement you can use is one for business expenses. This will allow you to record all of your monthly transactions related to your business. In this template you will keep track of things such as revenues, cost of goods sold and expenses. Like the business cash flow plan, people can also use the template for personal expenses. On this template you will be able to keep track of things such as your income along with expenses such as housing, car insurance, health insurance and credit card payments. By using this template you will have the means to keep track of your personal finances and make sure that your personal finances are in order at all times.